ROSEMONT, ILL, JANUARY 8, 2019 -- Emerson is changing the way companies leveraging the Industrial Internet of Things (IIoT) to control power and data with the introduction of its Appleton™ PlexPower™ Fiber Panel, the world's first hybrid panelboard for hazardous locations. This solution serves as a single point of control for both power and fiber communication cables to help users save up to 77 percent in installation, commissioning and maintenance costs. "We conducted extensive research with end users and customers and found that many have struggled with the complexity of routing hundreds of feet of dedicated power and fiber cables from separate enclosures. They want a simplified, cost effective connectivity solution to accelerate their adoption of IIoT technologies into their operations," said Mark Garton, senior product marketing manager, Emerson Automation Solutions. "The Appleton PlexPower Fiber Panel fills that unmet need in the marketplace by centralizing control of electrical circuits and communication patch panels in one enclosure located in the hazardous areas, resulting in reduced cabling costs, increased power safety, greater configuration flexibility and a more reliable IIoT infrastructure." The Appleton PlexPower Fiber Panel incorporates Belden MIPP fiber splice boxes that minimize installation time for fiber patching and enable hassle-free access during routine maintenance. It provides easy access for organizing and managing up to 12 ST (Straight Tip connector), SC (Subscriber Connector) and LC (Lucent Connector) type fiber connections, making it ideal for use in a wide range of industrial networking applications requiring maximum system reliability and flexibility. The Appleton PlexPower Fiber Panel simplifies IIoT in petrochemical plants, chemical plants, wastewater treatment centers, pulp/paper facilities, corrosive indoor and outdoor environments, or where flammable gases or vapors are present. Driven by the need for improved efficiencies, applications in the petrochemical industry will greatly benefit from this hybrid cabling technology. It will help to automate operational management of boilers, tanks, pumps, control valves and meters with intelligent sensors that collect maintenance and flow information, among other data. Like the original Appleton PlexPower Series panelboard, the new Appleton PlexPower Fiber Panel uses circuit breaker modules that provide explosion-proof protection for standard off-the-shelf breakers, eliminating the need for a heavy-cast enclosure. Component-level protection means the panelboard enclosure is lighter, more compact and easier to install. Breakers can be easily replaced, upgraded or added in the field with no bolted cover to remove, no need for sealing or rewiring and no danger of compromising flame path integrity. 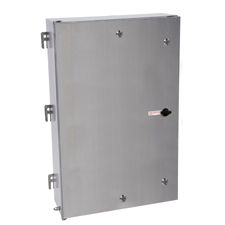 The enclosure is 316L stainless steel featuring stainless steel hardware and a hard drawn, tin-plated, copper bus bar for corrosion resistance and maximum reliability. The Appleton PlexPower Fiber Panel is available with multiple design options, giving end users flexibility and convenience in configurations, with a smaller, lightweight footprint.